Here are 10 AWESOME backyard additions, so that your kids have the time of their lives! This is a fun idea, that you can do all sorts of things with! You can add zippiness, tire swings, and more! Kids can come up with endless ways to play in a tree house! It could be a pirate ship! Or a spaceship! It could be anything! What kid doesn’t want their own fort? Sometimes one for isn’t enough? How good is a fort when there is no one to guard it from? So if you want to be awesome, put two forts across from each other, and set up water-ballon launchers, your kid will be the coolest kid in school! Every kid loves swings! I mean come on! They are so exhilarating! But there are many kinds of fun swings! Here are a few options, some work for both the kids and the adults! Would you like to teach your kids about how spiders work? Or you just want something awesome in your backyard that works great for the summer and halloween? Well this is it! THE SPIDER WEB! The ground trampoline! This is a cool way of having a trampoline, and it not taking up much space! Tires, are backyards best friends! You can do almost anything with tires! Like this for example you can make a seesaw! You can also make mountains to climb! This one is for people who want to go all natural, with a fun project! 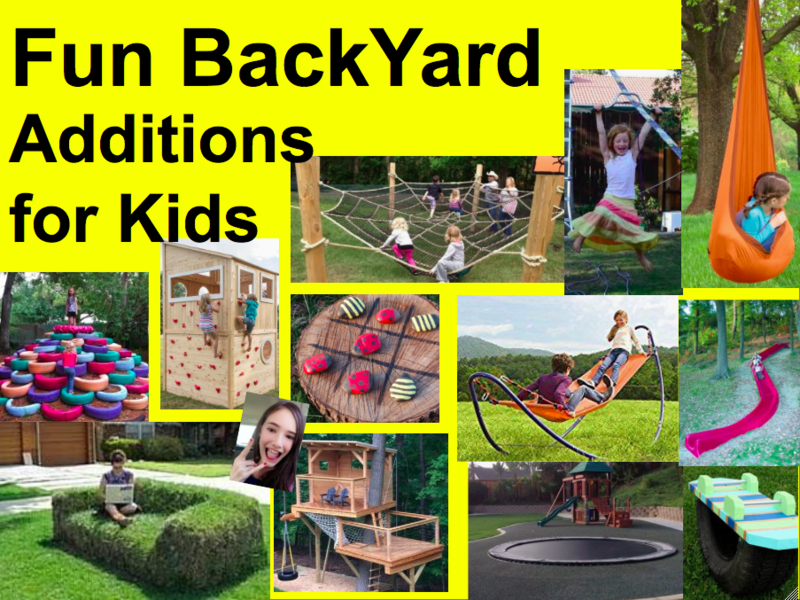 Here are some must have games, for your outdoor play land! Want a DIY Zip-line? Well this is the way to go! All you need is some back handles and rope! This is for people who have a hill and they can’t use it for anything else! Here are two options for you! Make an AWESOME WATERFALL THAT LEADS INTO A POND!!! Or build a cool slide! Simple but cute and fun! Those are 10 AWESOME AND FUN DIY Backyard additions! Comment: Which Backyard Addition was your favorite? Comment, like, follow, and share for more!